Have you ever dreamed about having a humongous kitchen, with an island in the middle, a walk-in pantry with plenty of room for all your storage, a separate cabinet for all of your spices, and a cozy curio for all your mugs and china? That’d be nice. Unfortunately, most of us have to find a way to get by in a much smaller kitchen, especially if we’re living on a budget. This can be especially true if you’re in a studio apartment, or sharing your kitchen space with a dining room that tends to get cluttered with kids’ homework. Even if you don’t have a luxury kitchen of your dreams, you can still create gourmet meals and make your kitchen into a pleasant gathering area of your house. Here are some small kitchen ideas to help you make the most of your small space, without having to do a complete remodel overhaul that can be pricey (and completely impractical if you’re renting). You might have gotten that ice cream maker as a special gift, and sure it’s fun… but if you only use it once every two years, it’s probably not worth keeping in the limited space of your kitchen. Try this exercise: Put some of your lesser-used kitchen gadgets into storage for a year and if you don’t miss it during that time, just get rid of it. 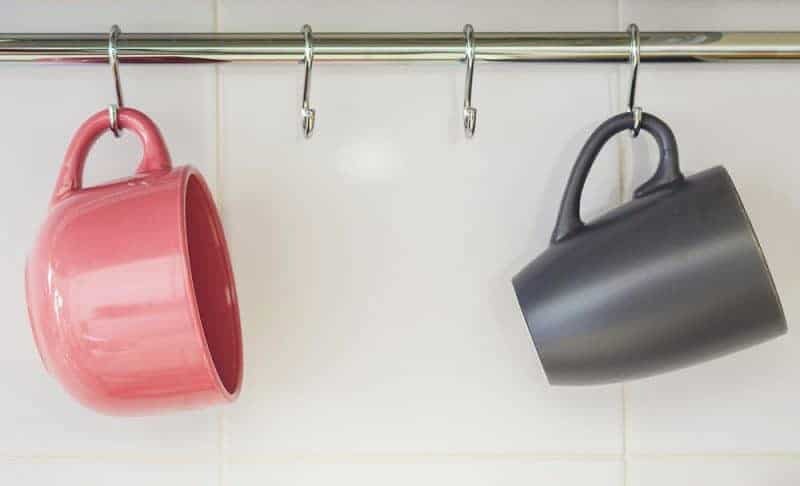 Other ways to cut back on the space that your appliances take up is to opt for things that do more than one thing. 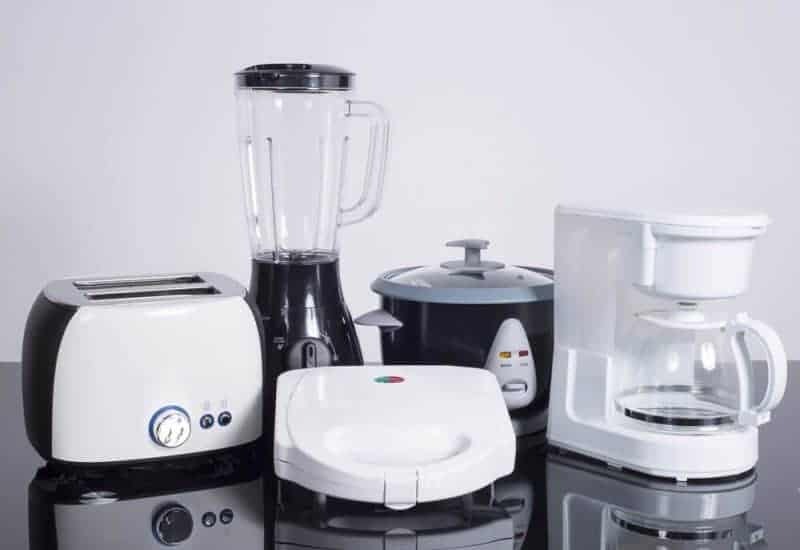 For example, a blender that also works as a food processor and bread dough mixer is much better than having one of each. It’s usually worth investing in a more expensive option if you really use it and it can free up significant space in your kitchen. Small spaces start feeling cluttered almost immediately. Even when the kitchen is actually clean, it can feel more crowded if you have small items all over the counter and floor. Instead, tuck things away to make the area feel more streamlined. There are tons of clever storage ideas for small kitchens to help to tuck away clutter in the kitchen. Many of them only take small adjustments to your kitchen. Install a cutting board that pulls out like a drawer. 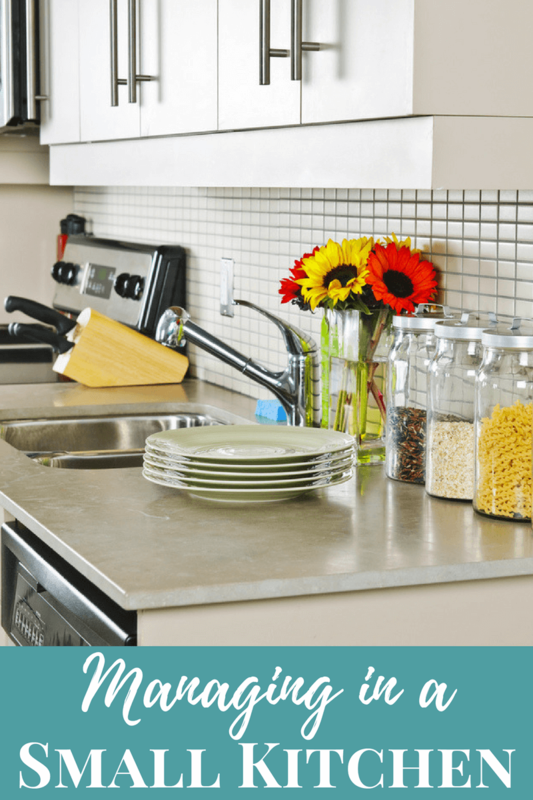 This way you can extend your counter space. Get a trash can that goes under the sink or can be tucked away like a drawer. Put clutter into boxes that slide out like drawers. This makes the kitchen look better, but it also makes it easier to organize and keep things from sprawling. This is great for shelves, your pantry, or even your refrigerator. Opt for swivel stools instead of freestanding ones. These are attached to the cabinets and tables, and tuck back underneath when they’re not in use. Consider a mobile table for prep space and storage. When it’s not in use, store it away in an adjoining dining room, or in the pantry. Do you have a double sink in a kitchen with limited counter space? Well, maybe there’s a better way to do it. For example, you can try drying dishes in a rack inside the sink instead of by the side. Better yet, redo the sink itself. There are quick options to install a counter over part of a double sink, or you can actually redo the sink itself. The key to a good sink is finding one that suits your needs. It’s amazing how each person has a different preferred method for using the sink. It can also be useful to trick out your sink with conveniences that eliminate the need to keep things AROUND the sink, like a soap dispenser. See more here. You can also store fruits and vegetables in hanging baskets. If you pick the right placement in your kitchen, it can also look really stylish. It’s even better for ripening produce. What ideas do you have for working in a small kitchen space? Share below! Great tips. We live in a smaller kitchen, and we’ve had to get creative on how to store things. We want as much counter space as possible, so adding floating shelves was one way to get stuff off the counter.